We have attempted to recreate our fabric materials and colors as closely as possible for viewing online, however personal screen resolution settings and monitor types can greatly change the appearance. Please feel free to contact us for a swatch book and we will gladly mail one to you. Each of our fabrics has been chosen for its superior wear and beauty. Attention to detail is a constant at Thomas. We're proud of that, and the satisfaction each customer experiences well after the sale. We truly look forward to providing you with the very best hand-tailored robes made today. Brocade's trademark of rich, vibrant colors and vivid patterns are machine washable. This beautiful fabric used in combination with our other fabrics, adds a luxurious accent to any robe. This fabric is being discontinued. Please call for current color availability. Other Brocade colors available are 0215 Burnished Gold, 0214 Ivory, 0218 Navy, 0217 Eggplant, 0216 Red and 0212 Wine. Luxurious look and feel. 100% Polyester Machine washable warm, tumble dry low, use cool iron. 100% Woven Polyester, silk-like feel is ideal for warm climates when cool comfort and elegance is desired. 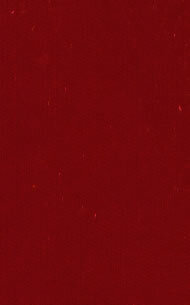 Velvet is available for use on clergy robe panels and sleeve trims. Only the finest velvets are used. 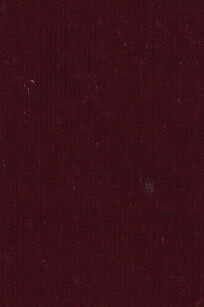 Velvet is a very delicate fabric and requires special handling. An alternative to velvet trim is either the #75 Clericade, #29 Brocade or #02 Brocade. Call for color availability for the #02 Brocade. If white panels are desired, we highly recommend the use of brocade which will not soil as easily and is easier to clean and maintain. Other Velvet colors available are 1103 Black, 1107 Brown, 1111 Emerald, 1113 Gray, 1108 Lt Blue, 1110 Navy, 1115 Orange, 1104 Purple, 1109 Royal, 1116 Rust, 1114 Spanish Gold, 1112 Teal Blue and 1106 White. Rayon and Brocance with cross and wheat design. Elegant brocade designed for use on clergy robe or clergy stoles. Dry clean only. Breezeweave -Most durable, 100% Acetate. Long lasting color, dry clean only. New PolyWool is 45% wool and 55% polyester. Lighweight yet made of strong fiber for a long lasting wear. Stain and soil resistant. Dry clean only. Texturized two-way Polyester Crepe for year round wear. Crepe weave sheds most wrinkles and needs little ironing. Wears exremely well. Machine washable - exclusive of trim & style. A soil release finish has been added to this exceptional fabric. Advantages of this fabric are maximum resistance to wrinkles ans machine washable. The texture also allows air circulation for added comfort. Other Wonder Crepe colors available are 5727 Orange, 5726 Sugarbeet, and 5706 Teal Blue, and White, Jelly, Khaki, Candlelite, and Brown. 100% Polyester, retains color, soil release finish. (Stains and odor wash out) Other colors available: Chocolate, Light Grey, Magenta, Mauve, and Orchid. Texturized polyester. A lightweight durable, long wearing fabric that breathes. 85% Acetate - 15% Polyester, dry clean only. 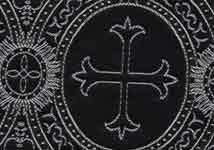 Brocade designed for use on clergy robe panels, clergy stoles or trim on cassocks. This fabric is being discontinued. Please call for current color availability. 100% Polyester has the sheen of satin with easy care of polyester. Can be used as trim fabric or the entire robe can be tailored in washable satin.